One of the wonderful things about traveling is discovering new dishes, ingredients and cooking methods. The ultimate way to get to know a country’s local and culinary specialities is to take a cooking class. 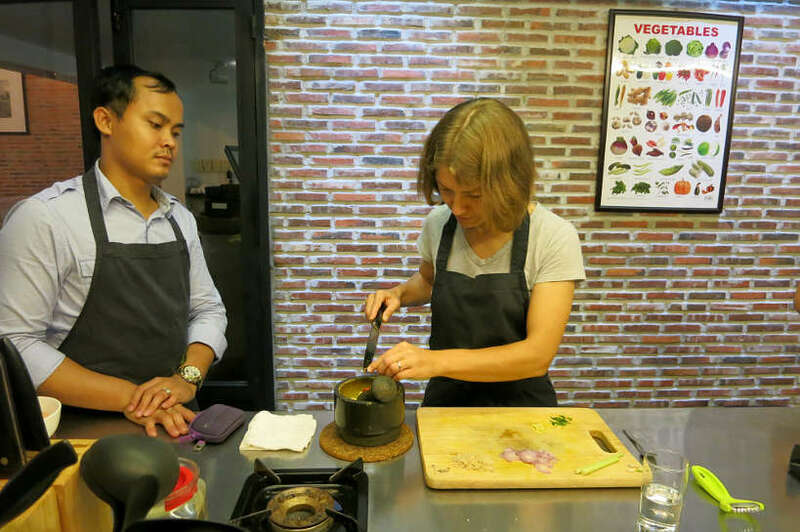 In Cambodia’s capital Phnom Penh, we took a half-day Cambodia cooking class with the goal of learning how to make Fish Amok, the National Dish. Read on and discover more about Cambodian Cuisine. 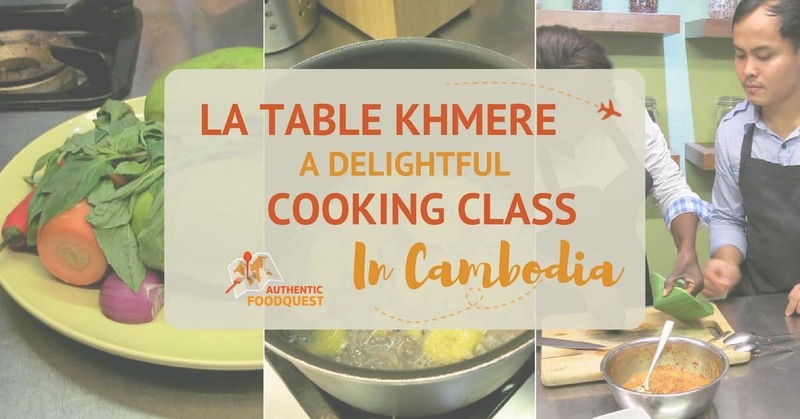 La Table Khmère is a restaurant and cooking school that focuses on traditional Khmer specialties. We discovered this cooking class while searching online for an intimate and authentic cooking environment. One thing that sold us on La Table Khmère is their dedicated focus to the flavors of Cambodian cuisine. Whether you eat at the restaurant or take a cooking class, the emphasis is on Khmer dishes. 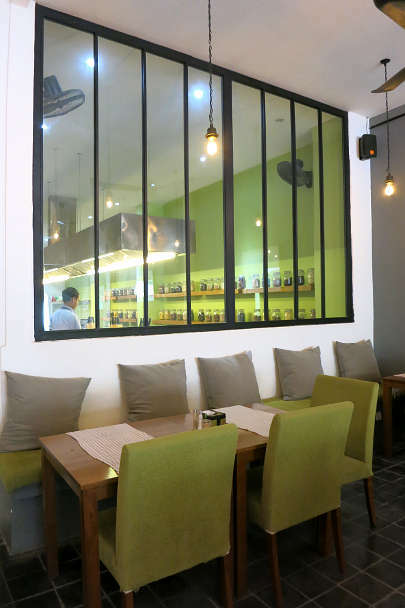 The restaurant has a modern feel, with wide open seating and lots of natural light. It is a great place to sample some of Cambodia’s traditional cuisine. The cooking class takes place at the back of the restaurant in a laboratory-like area behind a glass wall. Modern with stainless steel countertops, fully equipped individual workspaces and air conditioning makes it a comfortable place to spend half a day. Two cooking classes are offered daily. The morning class starts at 9:00 am with a visit to the local market. And the afternoon class is at 3:00 pm, with no market visit. Having already visited a couple of local markets in Phnom Penh, we opted for the afternoon class. Our main focus was understanding Cambodian cuisine, which had eluded us at that point. In an intimate class of four, a Swiss couple and the two of us, we enjoyed the personalized attention of our English speaking Khmer cooking instructor. Assisting him, was another cooking instructor, who kept a watchful eye on us as we cut, chopped and sliced the ingredients for the different dishes. We prepared and cooked all the dishes, non-stop for about 3 hours and then ate our meals in the main restaurant section. Eating Amok, is one delicious experience. However, cooking it is something else. Learning how to make this dish was a reminder of how much we have been spoiled by modern conveniences. The traditional preparation of Amok is by mortar and pestle. That means, you grind most of the ingredients by hand. This is hard work and much more difficult than it looks. Pounding our way through fish Amok! After everything was prepared, we learned how to make banana leaf bowls for steaming the amok. The banana leaves impart their subtle fragrant aroma to the sauce. Adding the perfect depth of sweet, salty and tangy coconut flavor. 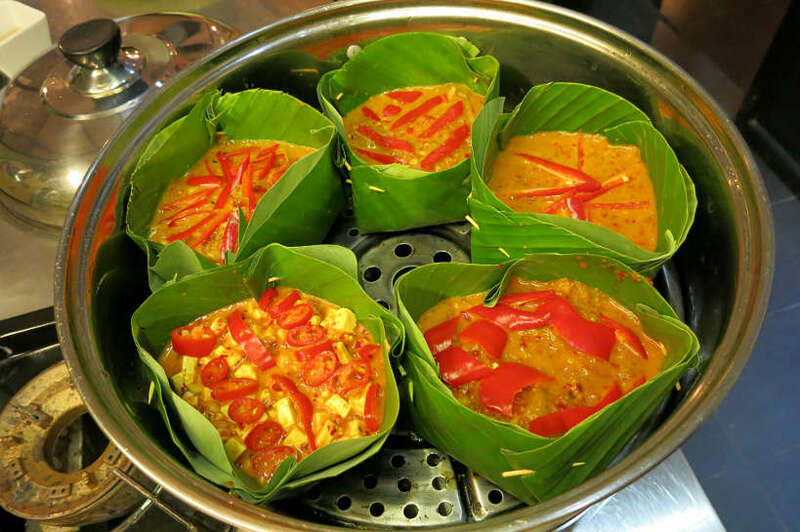 Cooking in banana leaves also makes the dish juicy, by keeping all the moisture during the steaming process. Download the recipe for Traditional Fish Amok from La Table Khmère. If you love Mangoes, then Southeast Asia is your playground. On our quest for authentic food in Southeast Asia, we’ve had some of the sweetest most delicious mangoes ever. Mangoes are native to Southeast Asia and you’ll find all kinds of varieties. 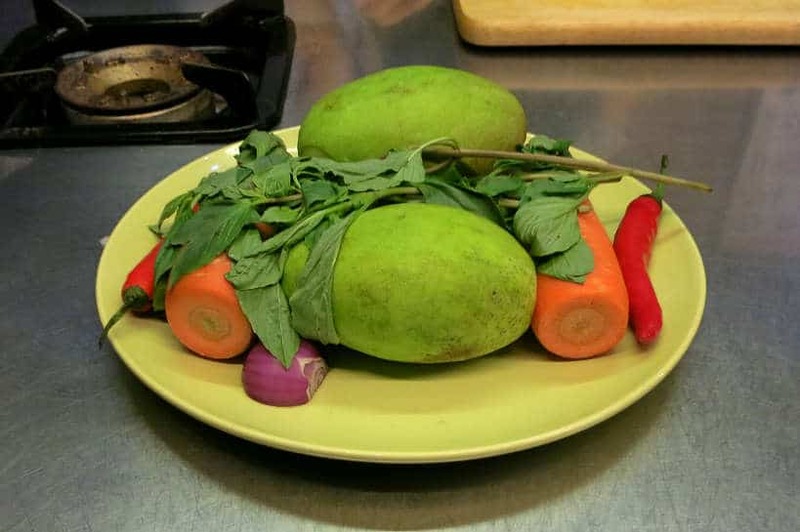 Green Mangoes were new to us and we discovered they are widely used in Southeast Asian salads and some desserts. Green mangoes generally have a tart taste with a crispy texture. They are firm and green on the outside. Sliced or shredded, they make mouth-watering snacks, relishes and dipping sauces for fish, and wonderful salads. 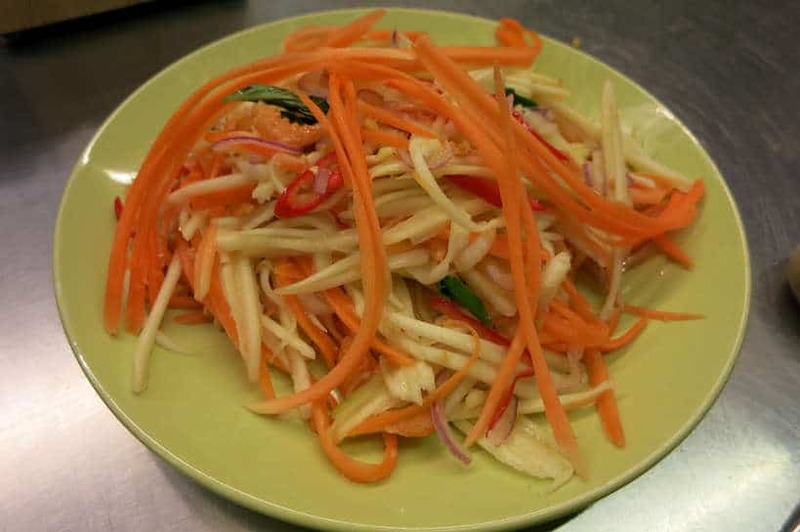 To make this salad, we had to peel and shred two mangoes as well as peel and grate one carrot. We laid them onto a plate while we prepared and sliced other ingredients to prepare the seasoning. In a mortar, we added the sliced chilies, shallots, peanuts, sugar and salt and some additional seasoning. After we had spent some time peeling and shredding, it was time to mix it all and pound it together. Contrary to the preparation of the Papaya Salad at our cooking class in Thailand, this time we really had to squeeze the mix until we got some juice out of it. This ended up being a delicious fresh salad. The green mangoes gave an interesting hint of spice and citrus to the dish softened by the flavor of the basil leaves. A really pleasant contrast of flavors! Download the recipe for the Green Mango Salad from La Table Khmère. Cambodian desserts are delicate and mouthwatering. This dessert is no exception! 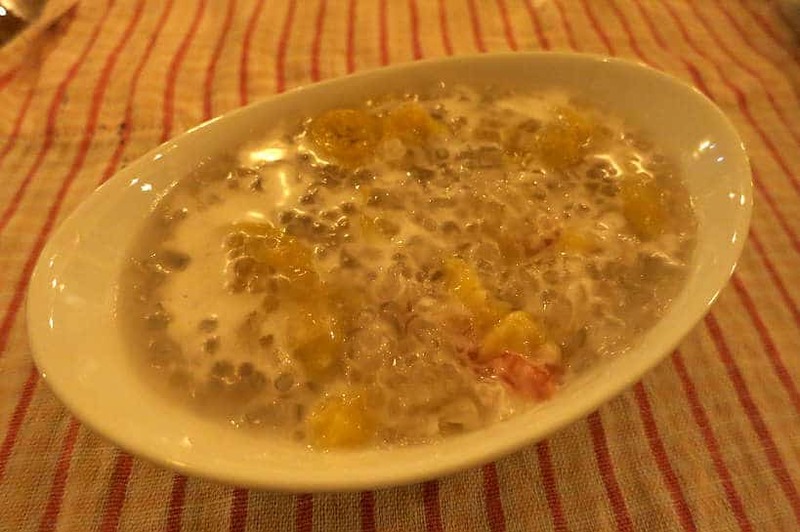 Chek Ktis is a delicious banana dessert made warm with tapioca, gelatin and coconut milk. 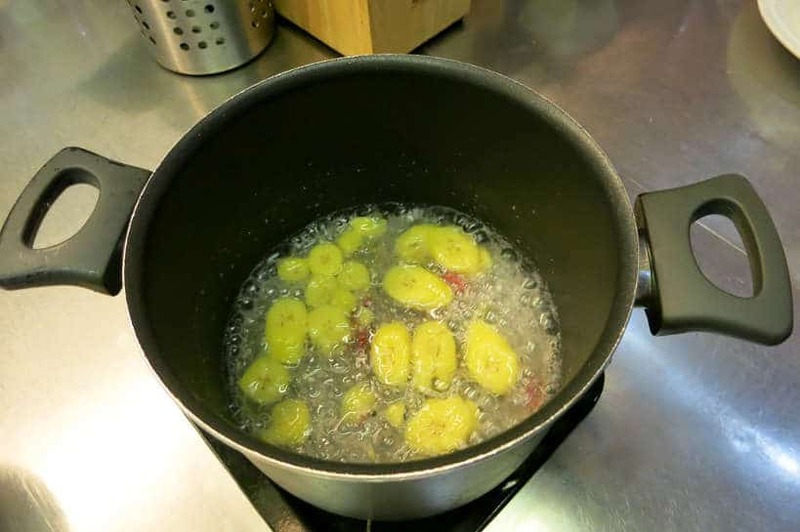 We sliced the bananas and cooked them in a deep pan with water, tapioca, coconut milk, sugar and salt. To make this dessert, we used Palm Sugar, a natural sugar popular in Southeast Asia cooking. We discovered palm sugar for the first time and learned that it comes from sap is harvested from palm trees. The sap is boiled and left to harden to reveal a light golden to rich dark brown colored sugar. Palm sugar does not taste as sweet as refined white sugar. It has a caramel and smoky taste which works really well with the dessert. Palm sugar has many benefits including a low glycemic index, which doesn’t have the blood-sugar spike effect (sugar high) that is common in regular refined sugar. For where to buy palm sugar, check out Amazon.com. This dessert was relatively easy to make and it resembled some popular Chè, Vietnamese desserts. It was a great finish to our meal. A sweet touch, not too heavy, to close the meal. Download the recipe for the Chek Ktis from La Table Khmère. 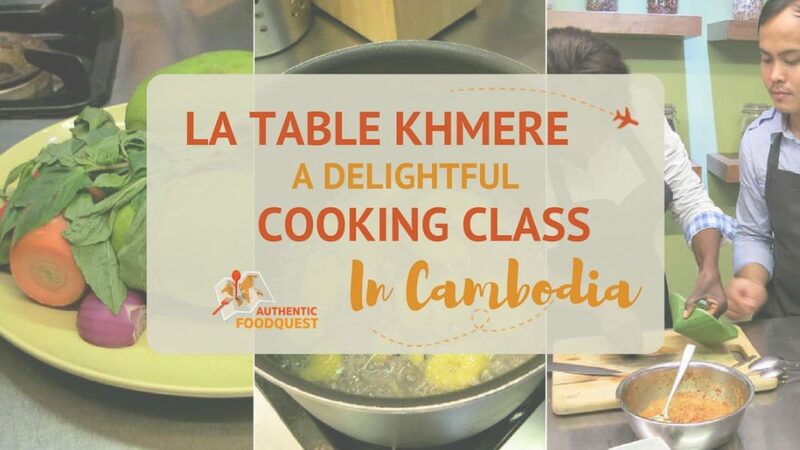 Taking a Cambodia cooking class at La Table Khmère was a really enjoyable experience. The instructor was knowledgeable and the environment fun and relaxed. After our 3-hour long cooking class in Phnom Penh, we sat in the main restaurant and leisurely enjoyed our food. Together with the Swiss couple, we enjoyed the delicious Cambodian cuisine we had just prepared. We left La Table Khmère satisfied and with a new appreciation of the Cambodian food. On your travels, take a cooking class and learn how to make the traditional dishes. You will find that your experience will deepen considerably. By way of example, Fish Amok was one of our favorite Cambodian dishes. When we learned how to make it the traditional way, pounding and grinding we developed a new appreciation for the dish and the people who prepare the meal. 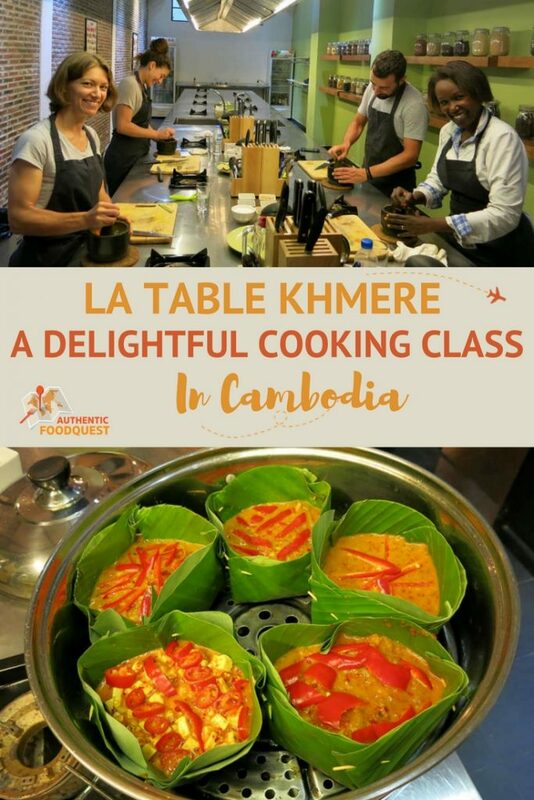 With La Table Khmère Cambodia cooking class, explore the local flavors and develop a richer understanding of the people and place. 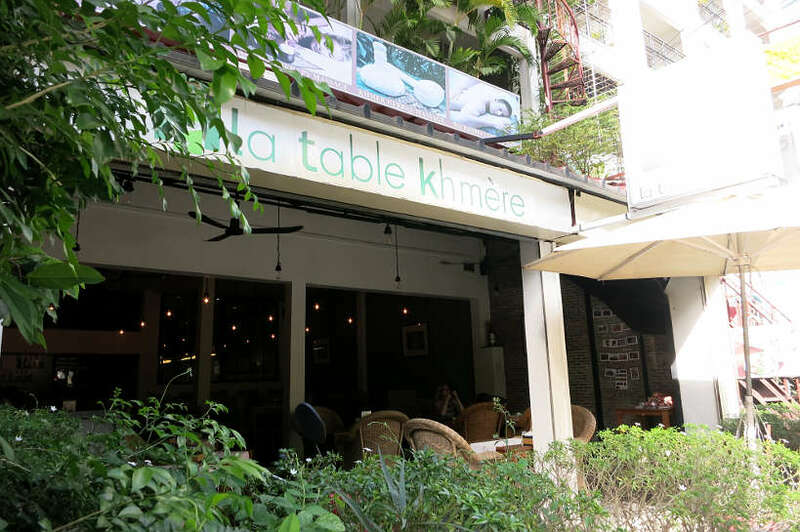 Address: 11E street 278, Phnom Penh; info@la-table-khmere.com. Classes are offered every day. Cost: $25.00 per person or $21 USD without a market visit. UPDATE! When you book your class online, in the drop-down menu tell La Table Khmère that you “discovered the cooking class by: Authentic Food”. You will get a complimentary soft drink, coffee or tea on us! Thanks so much Veronica. It was truly an amazing experience learning how to make Cambodian traditional food!! Thanks for your feedback. They say, if you want to know a certain culture of a certain country, taste their food! In your case, you were able to experience and even create it! That is so true Carmi, learning how to make the local dishes does give you a better appreciation for the local culture. Appreciate your comments. So fun! I love cooking classes while traveling. I have done them on several trips to Thailand. What a fantastic post! I really enjoyed the photos – they complimented your post perfectly. 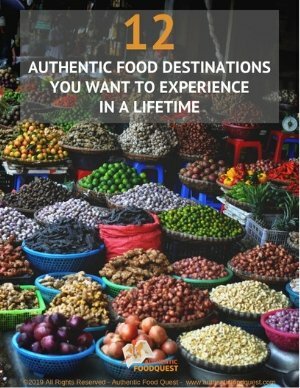 It never occured to me to take a cooking class while traveling but after seeing this I definitely will consider it on my next trip. The food you made looks beautiful! What a fun experience! Thank you so much, Tina, for your feedback. Indeed taking a cooking class allows you, we believe, to travel deeper. Take one on your next trip and see what you discover. Do come back and let us know how you found the experience. Cheers! That’s great to hear Kyla that we’ve inspired you take a class. Do let us know where you end up finding a Cambodia class in your area. Cheers! That’s awesome to hear Kyla that you are inspired to find a class. 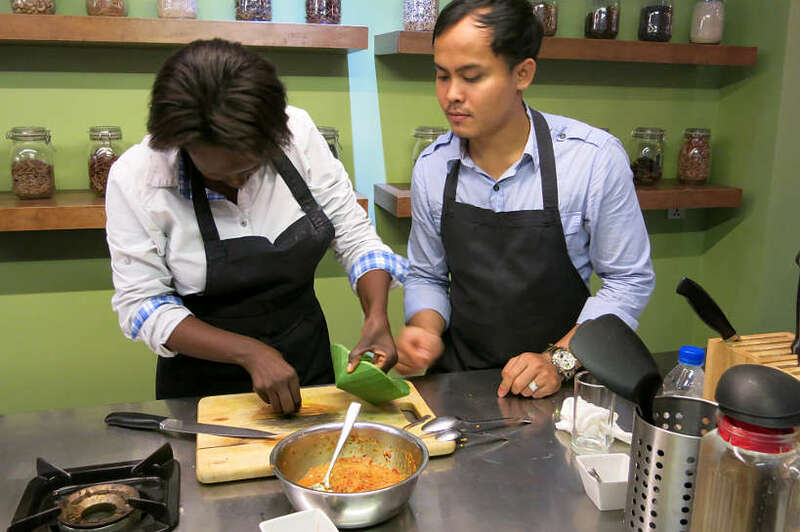 Let us know where you find a Cambodian cooking class in your local area. Thanks for stopping by. Hi Yuen, thanks so much for stopping by and sharing your love for Khmer cuisine. We’ll certainly check out your website for more about Cambodian cuisine. We discovered new smells like Kreoung and enjoyed that process. A truly wonderful experience. Thanks for stopping by! Looks like a fun experience! I’ve always wanted to attend some type of cooking class. Hopefully I get around to it this year! Appreciate your feedback Candy. And yes, indeed, do take a cooking class, you will find your experience to me much richer and deeper as a result. Let us know what you end up cooking! Don’t forget to check out our cooking class page for recommendations and partners. Cheers. Great photos, this looks awesome. I LOVE COOKING CLASSES! I mean with a passion. And this makes me sad that I never made it to Cambodia to dive into their cuisine. If I do though, this cooking class is on my list! Thanks for sharing. This might be the reason you need to head back to Cambodia and dive into their cuisine 🙂 Where have you had your favorite cooking class? What did you learn to make? Please do let us know!! What an awesome way to truly immerse yourself in another culture! Next time I go abroad, I’ll have to research to see if I can find a cooking class like this! Thanks Miranda and glad you enjoyed reading about the cooking class experience. Check out the cooking class page on the site for recommendations of classes and partners. Do let us know where you end up going. Cheers! This looks so nice and tasteful! I’ve never done a cookingclass actually, but would love to do one. Also would love to go to Cambodia, so double reason for a visit! There are so many reasons to Cambodia…and the food is one of the main reasons!! Do let us know if you end up going and if you need any tips or recommendations. Thanks for stopping by. Glad to have inspired you to take a cooking class on your travels. It really does open you up to a new experience. Stop back and let us know where you end up taking it!! Cheers and thanks for stopping by. Such a thorough description, both of the restaurant and of how the class is conducted. And the food pics look so very yummy! <3 Thanks for sharing. I love Cambodian food. 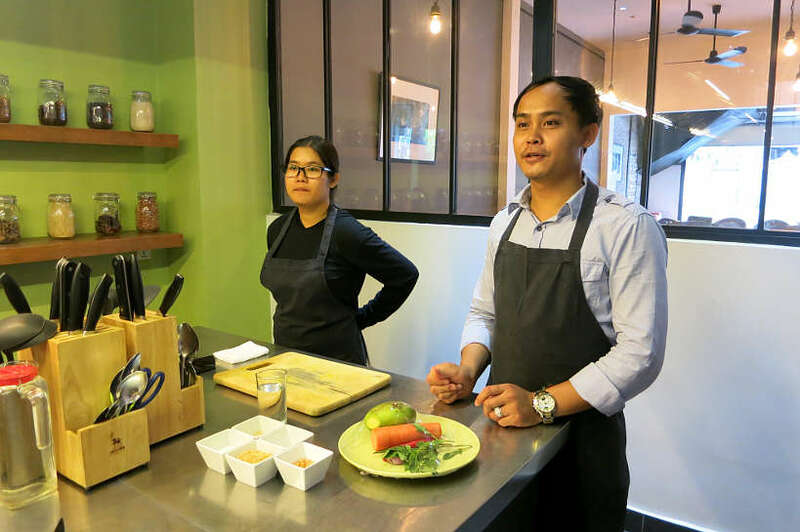 I wish I had time for a cooking lesson when I visited Siem Reap! Only more reason to go back! They all look delicious! I would love to try the ones in banana leaves! Glad you like the pictures. They were all delicious, including the fish Amok in the banana leaves. That looks fantastic. It’s so nice to do a class where they actually let you make your own dish, rather than jut assisting the main chef. I bet it tasted all the better. Thank you so much for sharing the recipes (lord knows where I’ll be able to source banana leaves). I love fish amok so I’ll give it a good go!! That’s awesome to hear Rosie that you will make the Fish Amok. Do let us know how it turns out. In terms of finding banana leaves, check your closest ethnic store. Glad you enjoyed the article. Thanks again! What a great ambiance for a cooking class! What you make looks delicious too! I have always wanted to try a cooking class when I’m traveling but all the sightseeing gets in the way, lol! Going to have to make the experience a priority because this looked like it was a lot of fun and then you walk away knowing how to do something new! You are right Sophie, you have to “schedule” in cooking classes like you do seeing the sites. It is a different kind of experience because all your senses are engaged and you get to eat your wonderful creation as well. On your next trip, take a class and let us know what your thoughts!! Thanks for stopping by. Thanks Anvita, indeed the green mango salad is absolutely delicious. Let us know how it turns out!! Cheers! This reminds me of the cooking class my husband took in Korea. It looks like the cooking class you took was very informative and a lot of fun. I would love to take a cooking class to learn how to make a unique meal for entertainging guests. 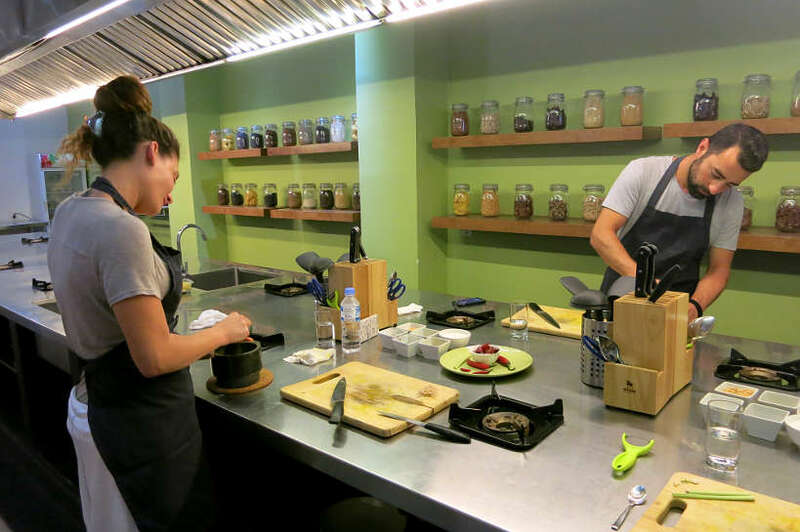 Taking a cooking class is indeed a great way to learn more about the local foods and learn new cooking techniques. The next time you travel, take a class and impress your guests!! And then, let us know what you made and how it turned out!! Thanks for your comments. These foods look absolutely delicious. I always have wanted to take a cooking class and learn how to make foods of different cultures. Appreciate your comments Tiara…just one simple question. Is there any reason why you have not taken a cooking class before? Give it a try. You’ll be surprised by how much fun it really is!! Let us know where you end up going! Cooking classes are the best! That’s so cool that you have the option to go to the local market! I love mangos and love learning how to cook with them. In the Dominican Republic, I learned how to make a ceviche that had mango and Lion fish. so Yummy! Oh, that sounds delicious Andrea. So true, cooking classes do open us up to amazing new experiences. Thanks for sharing your experience. thank you so much for sharing this post! now you are giving me more ideas of what to prepare this mother’s day! That’s awesome to hear Anne. Please do let us know what you end up making mom for Mother’s Day! Thanks for stopping by. Thanks Danik! Appreciate the feedback. 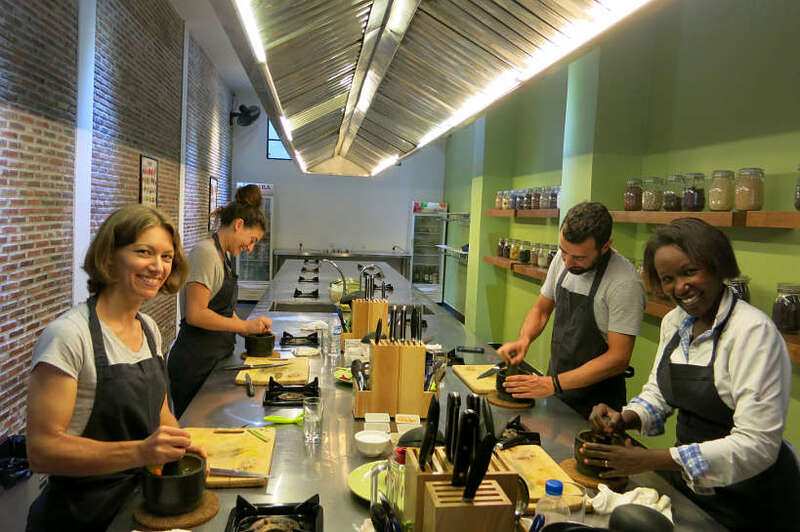 Have you ever taken a cooking class on your travels? Amazing experience learning how to make Khmer cuisne!! Cheers. Looks so delicious have to make this soon! That’s awesome to hear Natasha that you’ll be traveling to Cambodia soon. You’ll enjoy your visit and the cooking class is quite an experience. We highly recommend it!! Do let us know how it goes!! I am going to Cambodia next week! I am looking for something to do. I will take a look on this. Have a wonderful time in Cambodia. There is certainly lots to see and delicious food to explore. We had an amazing time at La Table Khmere and we most certainly recommend the class. Look into it and let us know what you think. Cheers! A cooking class is a great thing to do to learn about cultures in other countries! I would love to try it one time! Hi Victoria, indeed taking a cooking class does open you up to learning so much more about a local culture. Give it a go the next time you travel. You’ll have a blast!! Do come back and let us know where and what you learn how to make. Cheers! $25.00 per person is so so affordable! Love your feedback, Siddhartha. We 100% agree one’s visit is only complete once you explore the local food and ingredients. And the price makes it attractive as well 🙂 Thanks so much. This looks like so much fun and so delicious. I love a good Cambodian amok dish. 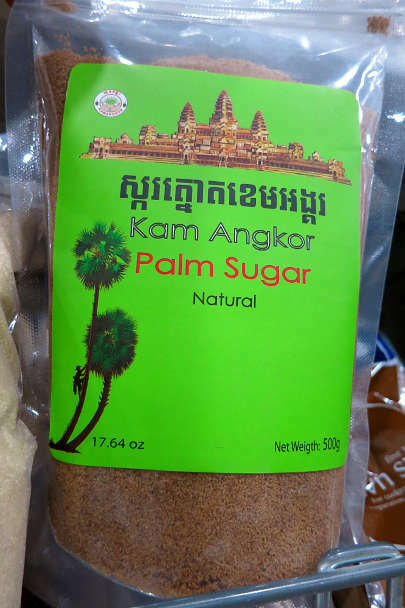 After being told about palm sugar when we visited Cambodia 5 years ago I use it all the time in my cooking. Have you started cooking these dishes yourself now that you’re home? That’s wonderful Jean that you also appreciate a good Cambodian Amok. It is truly delicious. Fish Amok is definitively on the agenda to be prepared at home, but it hasn’t happened yet 🙂 Will make it very soon. Palm sugar is quite an interesting and delicious discovery. Thanks for your comments!! Thanks so much Meg. Indeed by taking the cooking class we really found out how difficult the Fish Amok is to make. We now have a new appreciation for it especially after all that pounding. Agree, taking a cooking class is a great way to explore a local cuisine. Cheers! I love this article! Sluuurrrrp. 🙂 . The Cambodian Fish Amok looks quite delicious. It has also reminded of my own experience of trying my hand at Khmer Cooking. Best part was that was to be our lunch and I was glad to see my dishes were quickly gobbled up. Sounds like you had a delicious experience making Fish Amok as well. We certainly devoured it happily after the cooking class. Taking a cooking class is truly a wonderful way to learn more about the local foods and flavors. Thanks for stopping by. We love cooking classes–it’s such a great way to get insight on new cuisine, and bringing home the recipes is always a plus too 🙂 This looks like a great one to take and I love that you had a small class size. The food you made sounds delicious! You are so right Jenna, cooking classes are a lot of fun and full of insights. Where have you taken cooking classes before? Indeed the small and intimate classes do make a difference. Thanks for your comments.